April 8 the Roma around the world celebrate International Day of the Roma. This holiday was established in 1990.
International day of the Roma was created to commemorate the first World Romani Congress of the International Romani Union. It was the first major international meeting of Romani representatives, that took place on April 7-12, 1971 in Orpington near London. The first World Romani Congress was attended by 23 representatives from nine nations (Norway, France, Czechoslovakia, Great Britain, Germany, Ireland, Hungary, Yugoslavia and Spain). During the congress five sub-commissions examined issues of social affairs, war crimes, education and culture. 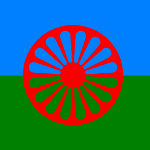 The Roma accepted the green and blue flag with a red six-spoked chakra as a national emblem of the Roma people, the song Gelem, Gelem was adopted as the anthem and the usage of word “Roma” instead of “Gypsy” was also accepted by the majority. International Roma Day is celebrated not only by the Roma, but also by those, who admire their unique culture. Various concerts and festivals devoted to the Romani culture are held in different countries on this day.